PHUKET: The B10 million, 80-foot cruise boat Lady Andaman sank yesterday (January 19) after hitting a concrete block, just 200 metres from the Chalong Pier. The skipper managed to get the badly leaking boat to pier and got the passengers off before it sank. The B10 million, 80-foot cruise boat Lady Andaman sank yesterday. The boat’s owner, who goes only by the name Sando, told The Phuket News this afternoon, “We had 32 people on board from five Muay Thai gyms – we do a lot of Muay Thai training off the back of the boat. That contract looks to be as thoroughly sunk as the boat, which is sitting on the bottom, its hull and lower deck underwater. The sinking echoes that of the “booze cruise” boat, which sank in February last year after hitting the same concrete block. The block is one of some 200 planted by the Harbour Master’s Office around Chalong Bay about 18 months ago. These were intended to be anchors for channel marker buoys, or for boat moorings. But the mooring lines between the blocks and the buoys have in most cases failed. As a result, the blocks, far from being navigation aids, have become navigation hazards, lurking on the seabed, ready to rip the bottoms out of unwary boats. At low water, the block that caused the damage yesterday is in just two metres of water. 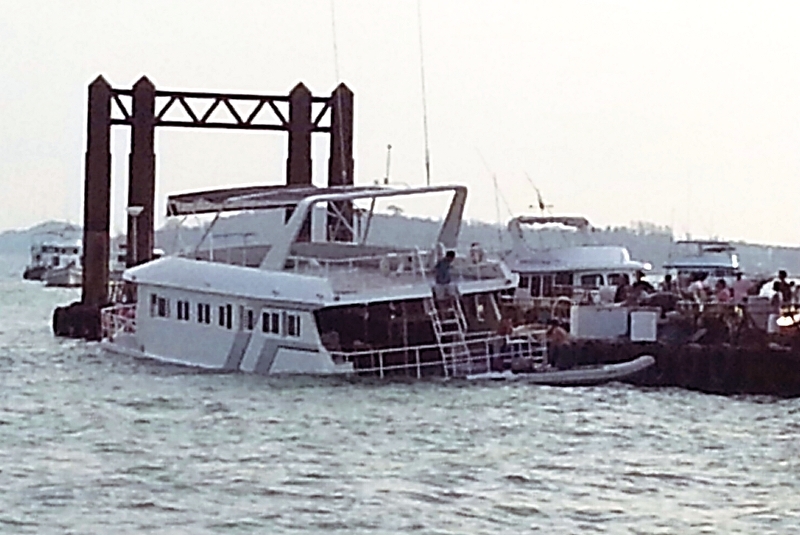 Another boat owner, speaking on condition of anonymity, told The Phuket News, “The sinkings are only part of the story. Every captain is totally paranoid about hitting [the blocks]. Almost every boat operator in Chalong has hit the blocks causing untold damage, lost business and near-sinking. He added that the storm of December 23 had moved some blocks out of the position, so that GPS bearings for them are now wrong. Until then, at least, boat owners will still have to contend with a hazard that, even if they are aware of it, may not be in the position they think it is in. UPDATE: In the evening Mr Puriphat called The Phuket News to say he would be visiting the crash site tomorrow (January 21).